Braai ui oor matige hitte tot sag. Voeg maalvleis by, roer met vurk tot los en braai tot gaar.Voeg kerriepoeier, borrie en sout by en braai 5min. Maak mielieblom aan met bietjie water tot pasta, roer by vleismengsel en kook tot dik. Laat afkoel. Sif koekmeel, bakpoeier en sout saam. Vryf botter in meelmengsel in. Sny die water met ‘n slaplem mes in, gebruik genoeg water om ‘n stywe beeg te vorm. Rol die deeg dun uit op meelbestrooide oppervlak. Druk sirkels, 9cm in deursnee uit. Skep teelepelsvol vulsel op elke sirkel. Maak die rande van die deegsirkels klam met koue water. Vou die helfte van die deegsirkel oor die vulsel en druk die boonste rand styf op die onderste rand vas. Braai die samoosas in warm, diep kookolie tot uitgerys en goudbruin. Mix flour and salt into a bowl. Make a well into the centre and add the oil and enough water to make a firm dough. Knead the dough on a floured surface until smooth and roll into a ball. Cover in plastic wrap and set aside at room temperature for 30 minutes. Divide the pastry into 12 equal pieces. Roll each piece into a ball and roll out into a circle of 15 cm. Divide this circle into two equal pieces with a knife. Brush each edge with a little water and form a cone shape around your fingers, sealing the dampened edge. Fill the cases with a tblpns of your chosen mixture and press the two dampened edges together to seal the top of the cone. 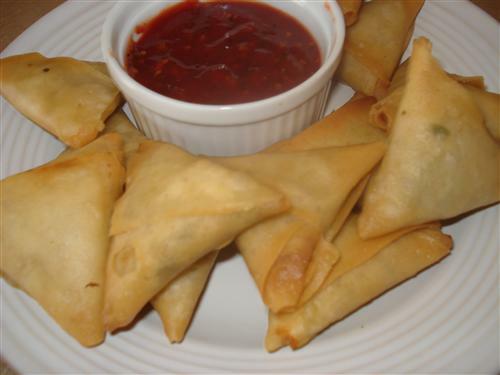 Deep fry the samosas in hot oil until crisp and brown take out and drain on a paper towel. In a bowl combine the corn, cheese, green chilies, black pepper, salt and mayonnaise, mix well. 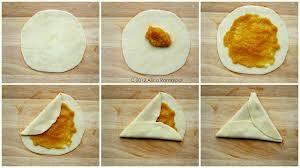 Now fold the sheet to make a samosa and deep fry till golden brown. Boil chicken with chicken cube and garlic till cooked. Dry water completely. Cool chicken and shred. Add in the corn, green chillies, coriander and cheese. Use as filling. Heat the oil in a frying pan, add the onion and garlic mix in the spices and seasoning and fry until soft. Add the mince, stirring until cooked. Remove from heat and stir in the mint and lemon juice.